The PTZOptics 12X Producer Plus Kit is a complete HD Broadcast Studio System that supports up to 4 cameras. Easily pan, tilt, zoom, and store presets with precision when using the VISCA joystick. The Producer Plus kits are for use with up to 4 HD broadcast cameras. The kits are designed around a Thunderbolt 3 external PCIe slot and includes a Magewell Quad SDI input card. 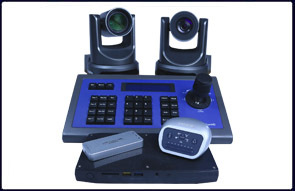 This allows you to use up to 4 cameras reliably without impacting the performance of your PC. The kit includes a powerful Intel NUC Skull Canyon and a single PTZOptics 12X SDI G2. The Producer plus includes everything you'll need for a complete system for recording and live streaming. You can use the Producer Plus kit with your favorite video/audio mixing program such as vMix, Wirecast, OBS, xSplit and many more. Using these software gives you the ability to make a custom experiences for your viewers exactly how you want it. Use lower thirds, overlays, virtual sets, and many of the other features built into these software to share your content exactly as needed. The PTZOptics 12X SDI G2 is a high quality broadcast camera capable of Full HD 1080p at 60 FPS. It features simultaneous IP Streaming, HDMI, and 3G-SDI. You can control the camera(s) through the VISCA joystick included in this kit. The Producer+ Upgrade allows you to use up to four SDI cameras at 1080p 60 FPS simultaneously without impacting the performance of your PC. Easily connect the exterior PCIe card to the Skull Canyon NUC via the included Thunderbolt 3 cable. The Shure Motiv MVi LTG is an audio converter with an XLR/1/4" input and a USB 2.0 & 3.5mm output. 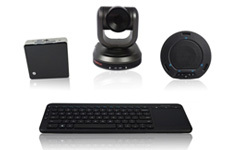 This allows you to connect a microphone or audio system to the NUC to use with a video/audio mixing program and live stream or record your content. The Skull Canyon NUC is a powerful miniature computer with a 6th gen 2.6 GHz processor. This PC comes with Windows 10 Pro and allows you to run any video/audio mixing program of your choice. The VISCA Joystick is a three-axis joystick giving you pan, tilt, and zoom control; in addition to preset, iris, and exposure control. When using multiple cameras you can easily swap by pressing the Cam 1-4 hot swap keys.